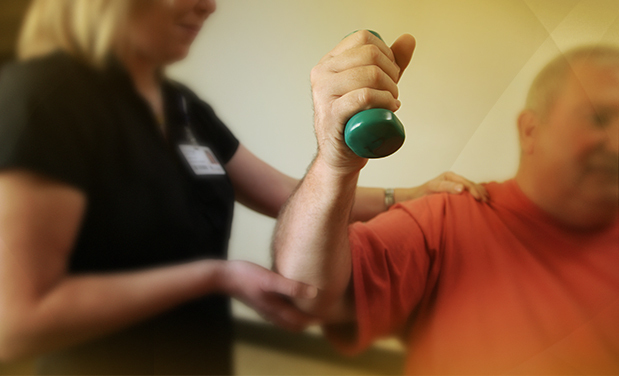 Memorial's comprehensive Rehabilitation Services keep you moving. Memorial’s Rehabilitation Services’ specialists provide skilled and experienced physical, occupational, hand, and speech therapy using the latest individualized treatments and equipment to get you going again. When you’re injured, hurt, or you’ve lost functional or recreational abilities, you want someone who is experienced to get you back on track. As the largest outpatient physical therapy provider in the metropolitan area, Memorial will do just that. Our team sees patients of all ages at The Orthopedic and Neurosciences Center, which is located on the Memorial Hospital Belleville campus. They treat patients with a wide range of needs, including orthopedic injuries, neurological disorders, athletic injuries, post-operative rehab, swallowing disorders, voice disorders, and more. Plus, our physical, occupational, and speech therapies all treat children. At Memorial's Orthopedic and Neurosciences Center, therapy services really step up when it comes to your care. The therapy services team features experienced, dedicated staff compassionate about what they do. They look at each patient as an individual. That’s important when each treatment plan is tailored to each patient’s unique needs. A physician referral is required for evaluation and treatment by a licensed physical, occupational, or speech therapist. Our rehabilitation therapists offer treatment plans for inpatients at Memorial Hospital Belleville, Memorial Hospital East, and Memorial Care Center. Outpatients have a number of convenient locations to choose from in Belleville and O'Fallon, Illinois, including Memorial's Orthopedic and Neurosciences Center. Effective August 31, Memorial’s Physical Therapy and Rehab Services located at 1634 Carlyle Avenue in East Belleville is closed. Patients can be seen at either of these convenient locations listed above: Orthopedic and Neurosciences Center OR Memorial Hospital East Medical Office Building. We look forward to continuing to serve you at one of these locations.